This cottage has been in my family for three generations and has been passionately maintained. We are experienced host, with over 30 years of welcoming guests to our cottage including families through the Cottage Dreams Organization. With shallow and deep water, sunset views and docks that are bathed in sunlight throughout the day - this Cottage is proudly maintained by the third generation owner. Ripple Cove is a home away from home, with everything needed to enjoy your Muskoka stay. The living room/kitchen/dining room and master bedroom enjoy lake views. 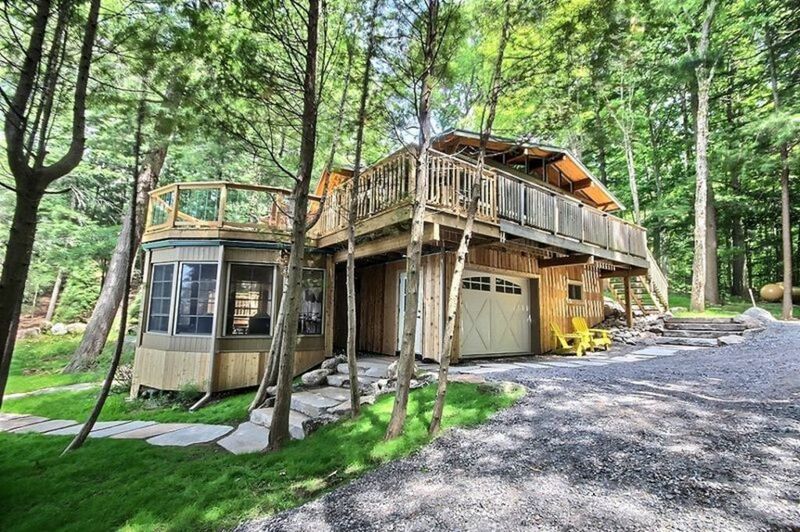 With decks, a screened in Muskoka room, big dock and cliff top look out - you can enjoy the views rain or shine all season long. Sitting in the living room, sunset is visible throughout the summer. Sit back and relax in this wonderful 3 bedroom all Cedar Cottage. Child friendly property and a quiet protected cove for that much needed R & R.
Ripple Cove enjoys sunset views throughout the summer and fantastic waterfront. Off the beaten path, on a cottager owned private road. Ripple Cove cottage sits at the base of a privately owned cove, sheltered from the wind. Master bedroom has a lake view and a king size bed. Recently renovated with wood floors throughout, this cottage has WiFi, cellphone service, dishwasher and Glass-ceramic stove. Bathroom renovated and new washer/dryer added to the property. BBQ on the wrap around deck, watching the sunset. Paddle and swim the beautiful rocky shoreline of Breezy Point. Walk into the hip deep water inside the sheltered cove, or walk out to your private dock and dive into 8 foot deep water. Swim out to the Lily pad swim raft. Enjoy the use of 2 kayaks, 2 stand up paddle boards and a canoe. Hike and bike the trails and paths surrounding the property, including the Walker's Point walking trails. Bring your mountain bikes, ATVs, water toys and hiking shoes! Docking space for boats, with nearby East Bay Marina and Walker Point Marina both offering boat launching. Use of paddles, life jackets and accessories needed for using provided water toys included. Owners nearby should you need assistance or want a boat ride tour of Lake Muskoka. Walk into the hip deep water inside the sheltered cove, or walk out to your private dock and dive into 8 foot deep water. Swim out to the Lily pad swim raft. Enjoy the use of 2 kayaks, 2 stand up paddle boards and a canoe. Hike and bike the trails and paths surrounding the property, including the Walker&#039;s Point walking trails.